Congratulations to Niklas Heinecker, Winner of the GuangDong Ltd Asia Millions (HK$34,600,000)! 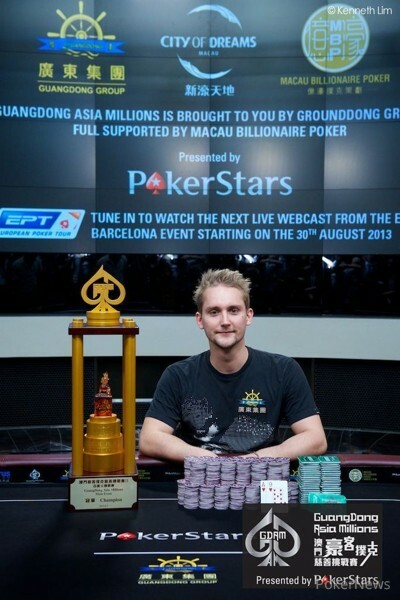 “This is easily the greatest day of my poker career,” Germany’s Niklas Heinecker said following his victory of the GuangDong Ltd Asia Millions (GDAM) Main Event. That’s not surprising considering Heinecker was awarded HK$34,600,000 (US$4,464,516) when he defeated Australia’s Jeff Rossiter heads-up to claim the title. When the final day of action began there were eight players who were all hoping to get where Heinecker stands today. Unfortunately there can always only be one champion though and so seven players had to fall by the wayside, albeit with at least HK$6,000,000 (US$774,193) for their time. With the average stack at the beginning of the day being only 15 big blinds, it is no surprise that the action was extremely fast paced. In fact it took just a few hands to lose Pratyush Buddiga in 8th place. Buddiga found himself all in holding and wasn’t able to hold against the of Igor Kurganov when the dealer spread out a board. Just a short while after Budigga’s elimination and Anson Tsang lost all his chips to Jeff Rossiter. 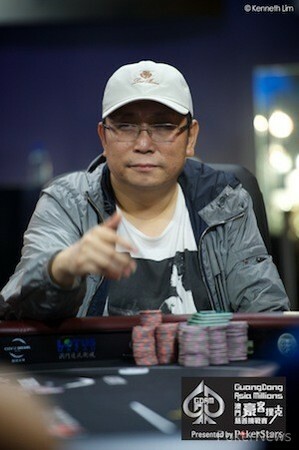 Tsang was all in preflop holding against the of Rossier and when a board was dealt, Tsang was sent home in 7th place. At this point the play somewhat slowed down for the first time as no player was eliminated for quite some time. However, during that period several players found themselves all in but managed to survive. Eventually it would be Igor Kurganov who would find the rail in 6th place, with his being unlucky to fall to Zheng Tang’s on a board. Picking up HK$8,300,000 (US$1,070,967) for his time, Kurganov now sees his lifetime tournament winnings exceed $5.5 million following a big year which includes multiple high roller final tables. If one player was to be described as having a roller coaster day at the felt it is Isaac Haxton. Prior to Kurganov’s elimination, Haxton was down to one big blind, but found a couple of double-ups to make the pay jump. Haxton would end up finishing in 5th place when blinds were at 700,000-1,400,000 and he shoved for 14.3 million from the small blind holding . Tang was in the big blind and called with his . The board gave Haxton a sweat on the turn, but it wasn't enough for the PokerStars Team Online member as he made his way to the rail. The least experienced player at the GDAM final table was Tang, but he would put in a solid effort to end up finishing in 4th place. Tang’s final hand saw him all in preflop holding against the of Heinecker. The board gave Heinecker a a pair of queens and enough to send Tang packing. Once again the action was fast and furious and it continued that way as Sorel Mizzi was sent home in 3rd place. Mizzi started the day as the chip leader, but was down to 23.2 million when the blinds were at 1,000,000-2,000,000. On his last hand Mizzi shoved his small blind holding and Heinecker called holding . Mizzi had two over cards, but when the board was spread on the felt, MIzzi was eliminated and the GDAM Main Event was down to just two players. At the beginning of heads-up play Heinecker held an almost three-to-one chip lead against his opponent in Rossiter, but with the blinds so high, it was still anyone’s tournament. Not surprisingly within just a few hands all the chips were in the middle and Rossiter was at risk. It was Rossiter’s against Heinecker’s and the board would be the last five cards the GDAM Main Event would see as Rossiter was sent home in 2nd place, while Heinecker was crowned the victor. We would like to congratulate Niklas Heinecker on his massive effort that will see him go down in history as the champion of the GDAM Main Event. He also happens to be HK$34,600,000 (US$4,464,516) richer for the experience. It was once again another superbly run tournament by the staff here at PokerStars LIVE at the City of Dreams and we look forward to PokerStars and the GuangDong Group (Macau) teaming up again in the near future to provide more high stakes poker action. For many of the big-name players who partook in the GDAM Main Event this week it will be straight back to Las Vegas to play in the World Series of Poker. Be sure to go check out all the live reporting of the WSOP, while we will be back here in Macau for the next stop on the APPT from June 12th - 16th. 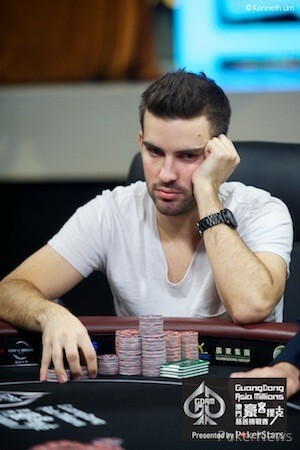 Jeff Rossiter Eliminated in 2nd Place (HK$24,500,000), Niklas Heinecker Wins! It took just a couple of minutes of heads-up play to find our champion! The final hand of the tournament began with Niklas Heinecker limping the button. Rossiter then jammed for 34.55 million from the big blind. Heinecker quickly called and Rossiter was at risk. Heinecker was just five cards away from a victory and when the dealer spread out a board, it was all over. A great effort from Rossiter, his 2nd place finish sees him take home HK$24,500,000 (US$3,161,290), which is easily his largest tournament score to date. Heinecker, on the other hand, takes home a staggering HK$34,600,000 (US$4,464,516). The first hand of heads-up saw Niklas Heinecker limp the button and Jeff Rossiter check. On the flop, Rossiter checked and Heinecker bet. Rossiter folded and that was that. The heads-up action has begun. Let's see who wins the GDAM. The players have gone on a short break as the live streaming final table prepares for the heads-up battle. Below are the chip stacks and as you can see Germany's Niklas Heinecker has an almost three-to-one chip lead over Aussie Jeff Rossiter. Sorel Mizzi has just been eliminated in 3rd place. His final hand started when he shoved his small blind. 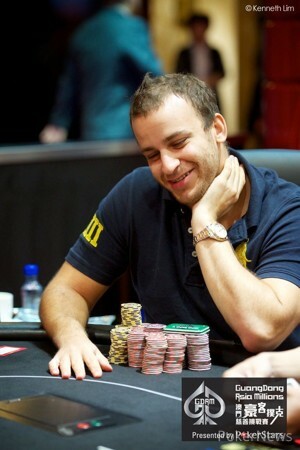 It was 23.2 million to the big stack of Niklas Heinecker in the big blind and he snap-called. The flop gave Heinecker a set of sixes and with a turn and a river completing the board, Mizzi was sent home with HK$16,100,000 (US$2,077,419) for his time. We are now down to two players! The next player eliminated will take home HK$24,500,000, while the winner will claim HK$34,600,000 (US$4,464,516). Sorel Mizzi, from the small blind, and Niklas Heinecker, from the big blind, took to a flop. Both players checked here, just as they did on the turn. Just a couple of hands after the break and we have lost our 4th place finisher. All the chips went in preflop, with Niklas Heinecker holding and Zheng Tang being at-risk holding . Heinecker took the lead on the flop and it stayed that way when a turn and a river completed the board.